The power take off shaft power of the engine driven hydraulic pump through a small hydraulic motor rotates through reducer drive mixing drum rotation. Concrete in transit, it is necessary to keep the mixing tank 1-3 revolutions per minute at a low speed to ensure homogeneity of the concrete while the concrete to prevent segregation, called agitation (stirring commonly known). Concrete mixer truck due to poor working conditions, so the quality of the hydraulic transmission parts, reliability is very high, if the failure is under construction, maintenance and trouble. There are two configurations on the hydraulic drive the market. Another type is the triple configurations, hydraulic pumps, triple gear (includes hydraulic motors, radiators, reducer), with this configuration is highly integrated, easy installation, beautiful appearance, but because of the hydraulic system oil and gear oil is the same kind of oil, so the oil requirements more stringent. With the development of modern cities, many of the construction are inseparable from the concrete mixer truck, concrete transport need to go to the site above. 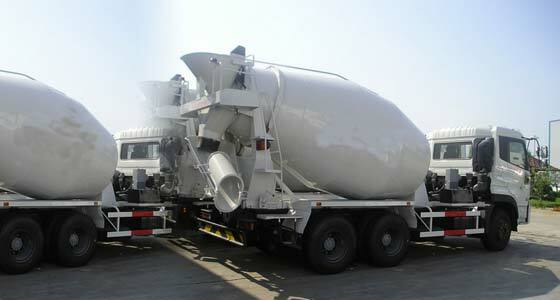 Therefore, people began to pay attention to this talent started to make money, to get a good concrete mixer sales. However, many people purchase mixer back, did not mind too much during transport vehicle in which the focus changed? Now, we tell you explain, concrete mixer truck during transport of the drivers how to change to avoid unnecessary trouble. 1, concrete mixer truck before loading the car residual concrete blocks should be cleaned with water after the water tank walls moist exhausted. 2, the front of the station, the delivery note and carried verify the strength of concrete mixer truck, car hanging identifies a blog. 3, concrete during transport, mixing tube should be low speed (3 ~ 6r/min), heavy concrete mixer fastest car driving must not exceed 50km / h.
4, after reaching the destination, you should check the identity of 0 and needs pouring concrete strength requirements are the same parts. 5, the front loading, high-speed rotating mixing drum to be 30 seconds, and then reverse the material, such as sedimentation tank or the concrete slump loss is too large and not pumping, the response to the high-speed rotation for three minutes and adjusted before the material. 6, the driver may not be in the way, add water to the car in the field, without undue stay or eat (especially at night) on the way. 7, if the concrete transport vehicle malfunction, should take the initiative to contact suppliers mixing station mobilize other vehicles to be supplemented in order to ensure a continuous supply of construction site concrete. 8, if the transport process in case of traffic congestion, can not guarantee the timely supply of concrete should be notified by telephone immediately following vehicle changing transportation routes, in order to ensure a continuous supply of construction site concrete. Finally, here’s a warning for each open concrete mixer truck drivers, the time to be careful while driving, not because of a hurry, and the emergence overtaking, speed and so on. However, the general vehicle accidents, because drivers underperformed the process, mainly those matters too, which led to the phenomenon of accidents. Stay in the concrete mixing truck with concrete can save much time? I stirred in my little group of concrete mixer truck 3.5 inches, and start using it, if you have been able to maintain water mixing concrete how long? I guess you can remain for several hours, because it is always stirring, but I’m not sure of this. Experts to specific points, not wins grateful! After a few hours it reaches a critical point, then no matter how much water it will add solidified …… stirring time in more than one hour in the mixer …. Experts answer … This is what I have been looking for. I suspect, no longer than an hour, but I’ll try to be extended to a half hour. A guy that can store a few days in the concrete mixer: I think this is incorrect. This is a ready-mixed concrete, not the rock rolled down the cliff! Just continue stirring concrete mixer, I think it will save a few days or longer. Of course, you need to constantly add water, so that when the water is absorbed more water to keep the air injected liquid agitation correct.